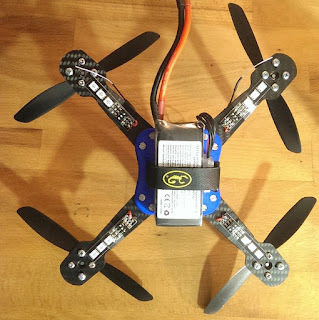 I've been flying the derbe evo for a while now, and it is very agile and fast. I had to reduce the PD parameters by 30%. This is due to the fact that the mass is closer to the centre of the copter, and that reduces the moment of inertia. 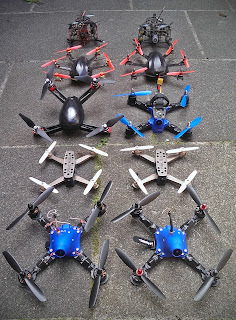 I was flying a competition with the derbe evo already (Hannover Cebit FPV Cup, here's a video). Unfortunately, the derbe evo crashed very hard during the qualifying (the gates were made out of massive steel, and the video reception was very poor). I think, I was frontally hitting a metal tube, and the 3D printed frame broke (two Cobra motors also have a bent shaft - I had to replace them as I do not manage to remove the shafts).